This is the first Black saint/holy one to be featured during this year’s celebration of Black History Month by my apostolate. Also, this is the first official installment of Black (And Catholic) Like Me an article-series that will feature a Black Catholic saint from history (or soon to be one) and tell a little about him/her and what I believe we can all learn from this godly one about holiness. For the title, I drew some inspiration from the title of journalist John Howard Griffin’s 1961 book “Black Like Me” though I am not drawing from its content. 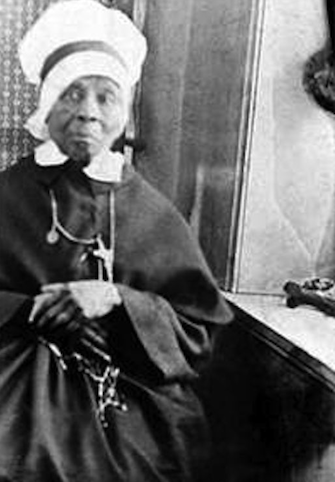 I’ve always like the ring of its title, but along with that – I’m Black and I’m Catholic, and here are some great Catholic examples who were Black as well. Additionally, while canonized people and those on the way to being canonized will be the main focus, I may also include recent examples of Black Catholics (deceased and living) who are also good examples of “Catholicism through a colored lens.” The holy ones featured in this series will be added to the Black Saints and Holy Ones list described below. It is highly appropriate to have her be the focus today being this is the anniversary of her death! The following is adopted from the bios of Mother Lange from the Oblate Sisters of Providence (OS), her Cause’s website (C), and her Wikipedia page (Wiki). I mixed them all together from the best details they each had about her life to form a streamline of information. Click those links for more of the info I used. – Not much is known about her early years. – She lived in a primarily Haitian community. – She received an excellent education and in the early 1800s. – Lange soon noticed that immigrant children lacked an education. Also, there was no free public education for African American children in Maryland, which did not come until the late 1860s. – She later met a Sulpician priest named Fr. James Nicholas Joubert who taught catechism to Black children. – This occurred on July 2, 1829 when Elizabeth and three other women professed vows and became the Oblate Sisters. – Elizabeth Lange took the name “Mary” and began the congregation as the first superior general. 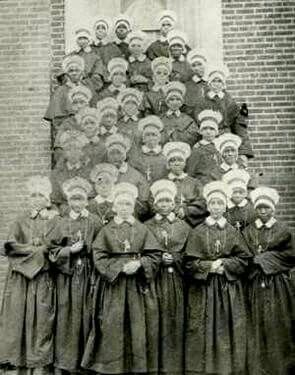 – The school they founded which became the St. Frances Academy, still operating in Baltimore today. I will post a personal reflection on her life in the next few days. Then she will be officially placed in the Black Saints page. I do not think Mother Lange is in this picture. Public Domain. Oblate Sisters of Providence – Mother Lange’s order alive today! Mother Mary Lange pray for us!